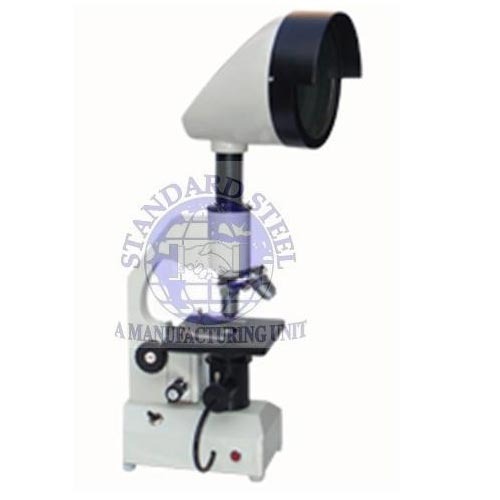 Microscope Body is heavy duty, inclined monocular type with sturdy base. Equipped with Coarse & Fine Focusing systems with Quadruple revolving Nose Piece. Plain stage (120x120mm) with graduated Mechanical Stage for X-Y movements of specimen slide. Built in light by 6V-20W halogen lamp with continuously variable light intensity control. The whole system of condenser & light arrangement is moveable up & down by rack & pinion to get the optimum results. Projection Doom of screen size 150 mm is rotatable through 360°. We Standard Steel began as manufacturer of various kinds of equipment like hospital furniture, medical lab equipment, blood bank equipment, dairy equipment, laboratory furniture, mortuary equipment, microscopes, laboratory equipment, laboratory instrument and operation theater equipment. This is widely demanded in the various sectors. Established in the year, 1998, we have achieved expertise in our domain and are recognized as a leading Exporter of a wide range of hospital furniture, medical furniture, hospital equipment, and laboratory furniture. We have state-of-the-art manufacturing facility that is equipped with latest machines and tools. This unit help us to manufacture the products in an efficient and effective manner. Our team of professionals hold expertise in this domain and work towards achieving the goals of organization. We use high grade raw material and advanced engineering techniques in the process of manufacturing these products. Our range is also customized to meet the necessity of customers. With the support of our Director, Mr. Sachin Kumar, who has rich industry experience in this industry. His able guidance and enormous support has made our organization a pioneer in this domain. We are a client centric organization and this has helped us to gain the trust and confidence of customers.